Depending from which side you approach the Huaca Pucllana – the biggest pre-Inka temple in Lima – looks like a huge pile of dust and pebbles. 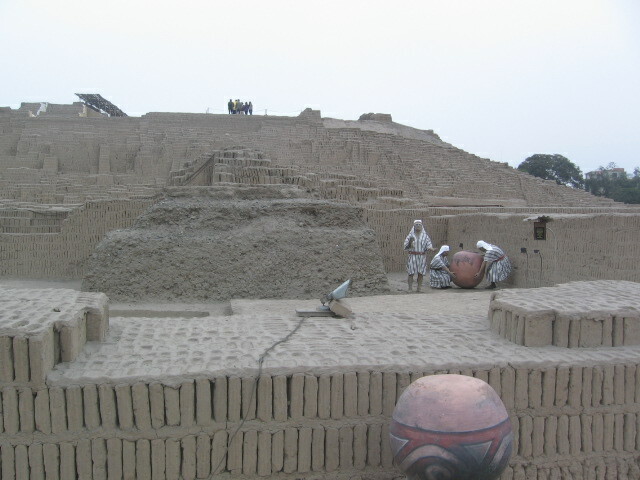 At closer sight, it is one of the most important archeological sites about the Lima, a culture much more ancient than the Inka. It’s only possible to visit this monument with a guided tour that includes lots of information about living conditions, agriculture, other civilizations at the time and the history of the building as such. What impressed me most was that this ancient monument was earth quake safe. Obviously in a region which is frequently struck by strong earth quakes, this was a good idea. It was achieved by arranging the bricks vertically, with small spaces in between (see above), giving blocks of bricks a ‘V’ shape with inverted ‘V’s in between. Unfortunately, the pictures I shot of this structure are too bad to be posted, so please try imagining if you can. This entry was posted in La puce enchantée, La puce entdeckt die Welt and tagged Lima, Peru, visits. Bookmark the permalink.